I love them on an old cardigan. And I especially love them as giveaways! I made this little half-apron last night, and I thought it would be fun to hand it off to someone who might want it! It's made from a vintage men's Valentino handkerchief, and some coordinating vintage fabrics from my stash. To enter, leave a comment sometime before Sun, March 7th at 8AM. If you'd like extra entries, you can link to this giveaway from your blog, Facebook, or Twitter, but make sure to leave a comment for EACH of those that you do, to get the extra entries! You inspire me! My very first real sewing project was your darling skirt you just recently highlighted on U Create. I'm working on some ruffle stuff to enter in your contest. I love, love, love this and I am so excited! Ridiculously cute! You're very talented! So adorable...My little Ella would love this! So cute! I love aprons- you are so talented! awwww this is soo cute! you are so talented and creative. i admire people who can just pick something up and create something new on a whim! i would love to give this little apron to my future sister in law for her bridal shower! I love them pinned on that shirt! The apron has to be my fav! Cute! I love the idea of pinning one to a top like a flower. How simple and clever. Oh how lovely. I would wear that in a heartbeat! I love these colors! Please count me in! I love this!! So cute! Thanks for sharing. 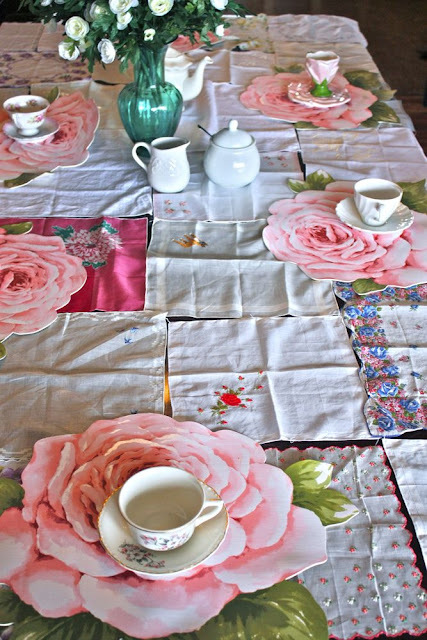 I HAVE A HUGE STASH OF HANKIES AND YOU HAVE JUST GIVEN ME SOME AWESOME IDEAS ON HOW TO REPURPOSE THEM. I ESPECIALLY LIKE MAKING THEM INTO FLOWERS TO WEAR. I love hankies too! I have a whole bunch of my grandmothers thanks for the great ideas in how to make them special! How cute! Another great idea!!!! I love hankies too. Thanks for sharing these cute ideas on how to use them! I love the apron & the hair cover. I have been buying hankies that were pretty - now i have something to fo with them! You are so awesomely creative and I love them all ways!!! This is a great giveaway!!! Thanks Disney!! Great giveaway, I'm keeping my fingers crossed! Also, question - do you have any tips on how to do the hankerchief flower pins (pictured in your 5th picture)? It's so beautiful. I love that the internet has allowed us all to share such wonderful and unique pieces. So cute, your apron came out better than the one I made last night that I'll be posting some pictures of today on my blog. Love all those hanky ideas! How cute is this? I love it! Where do you find all your hankies? The tablecloth is adorable! What a sweet little apron! I love it! That's super cute. You're so creative! What a beautiful creation!! I love that you took something old and made it into something completely new and beautiful! Thank you for this opportunity! You are so clever! I would love to be the proud owner of such a lovely apron! Oh how beautiful! 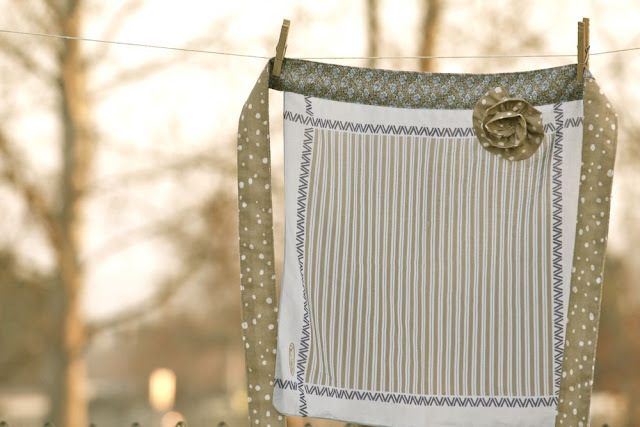 I have handkerchiefs I've been saving (my Grandmother did the lace herself), and now I have some beautiful ideas on how to use them :) Thank you! I love vintage hankies too! One of my fave shops on etsy includes a vintage hankie with every order and I get as excited about the hankie as I do about the item I bought! Thanks for the great ideas on how to use them! I love the apron you made with one! Super cute! I'd love to win! Thanks! I hope I win. I collect vintage aprons so to have one made from a hanki would be awesome! I would love to win this adorable apron! So cute! Love the hankies! And Love the Apron! I love vintage hankies too! I am working on a duvet cover for my daughter's room made out of them! Love it! I have a thing for hankies also! This has made me want to go out to an antique shop and buy some hankies. Thanks for sharing! this is so cute, i'd love to see it in my kitchen! LoVE, LoVe, LoVe, LoVe, LOVE this apron! it actually makes me feel like baking some cupcakes or something:) I also LoVe all your ruffles ~ you've inspired me. I even tried the J-Crew inspired necklace! Thanks! That apron is so adorably yummy. I would love that! Your blog is super cute. I will put your link on my craft blog. Too cute! I've found several things on your blog that I'm wanting to try. 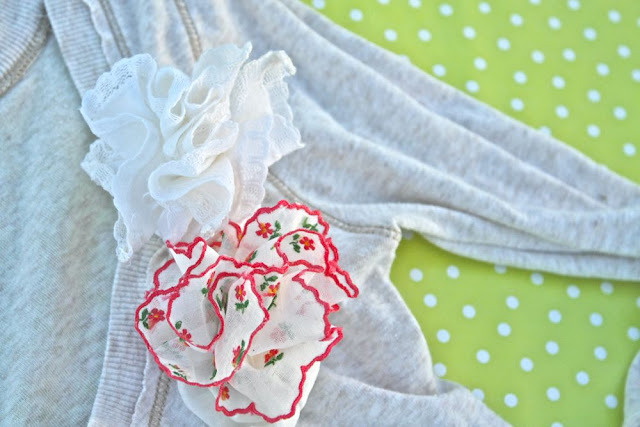 I've got two little girls so I love your ideas for extending the life of the clothes they've outgrown. Thanks for all the wonderful ideas! WOW I love it so simple yet so elegant! You are so crafty!! Thanks for the giveaway. Have a wonderful day! cute . . . thanks! Yay for giveaways, the apron is adorable! You are such an inspiration! You're so crafty, and creative. Thanks for making this and doing a giveaway! This is absolutely adorable. It also is really nice to see the consolidation of all of the uses :). so cute! I love the flower on it too! Where do you come up with all your ideas? Amazing! Just discovered your blog and totally adore it. I'm a huge hanky fan, and make sure to embroider them for all the men in my life - no man should be without a hanky. Gorgeous and such a great giveaway! Thanks! My daughters and I recently happened on your blog and now we are all hooked. I love your ideas because we could never think of 'em but we can all do them now. Thanks for letting us copy you. You are fabulous! That is so adorable! I love the colors! Just lovely darrrlling!! Very pretty! Where do you find all these vintage hankies? Perhaps people 'round my parts just don't like to sneeze in style, but I never see any cute handkerchiefs in thrift stores. I Blogged about your wonderful giveaway. I love it! I love you blog, it's so inspiring! I would love it ... so pretty! So cute! Makes me want to be in the kitchen even more! O my gosh!! so cute!! you are honestly a genius at reworking things and creating new uses for them! love it. I love vintage! I think you've just given me some new inspiration! I want some vintage hankies now! That is o awesome!! I love them too; I recently got some from my Mammaw awhile ago. 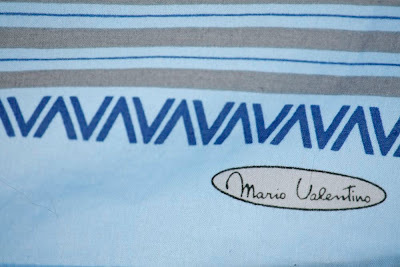 The embroidery is just exquisite. Wow! I've made LOTS of aprons, but never thought to use a handkercheif. Very resourseful and ubber cute! I really like the color of the apron! What a pretty hankie! This is so cute! I hope I win. This could be my first apron. It's super cute Disney! Love it! I linked this to my blog! love it & your blog! These pictures leave me yearning for hanging clothes on the line in the warm sunshine... It's lovely! Such a great idea! Why can't I think of these things?? That's so cute!! What a clever idea. I have been sewing since jr high but had always gone to buy my fabric, thank you for getting me out of that rut!!! Please enter my in that fun give away??? Ooo! Too sweet! Hope it's me! too cute! I love reading your blog! 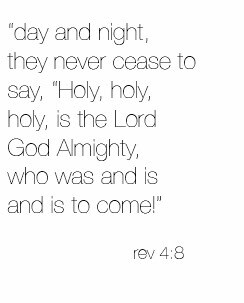 Everytime I see your posts it is like a little ray of sunshine and today it is shining extra bright! How lovely! Oh my word! Love aprons and love vintage hankies! I had never thought to combine the two, though...genius!!! I love reading your blog! It helps me be inspired to create with what I have. Hope I win!!! so precious! your things make me happy! I LOVE all the ideas!! Thanks for the opprotunity! I just love it, I have a bunch of my grammy's and I agree that they are so special. I love the ones pinned onto the shirt. So creative! I just love using vintage items!! Oh it's just darling...please count me in! Oh, I'd love to win this! It would be a perfect gift for my cousin's wedding shower in a few weeks. Ooooh, this is foxy! I love the color choices. How cute! A girl can never have enough hankies or aprons! How precious! I see old handkerchiefs at an antique store I frequent all the time. Great ideas! Thanks! I have a thing for aprons so you know I would love to have it! Fun!! 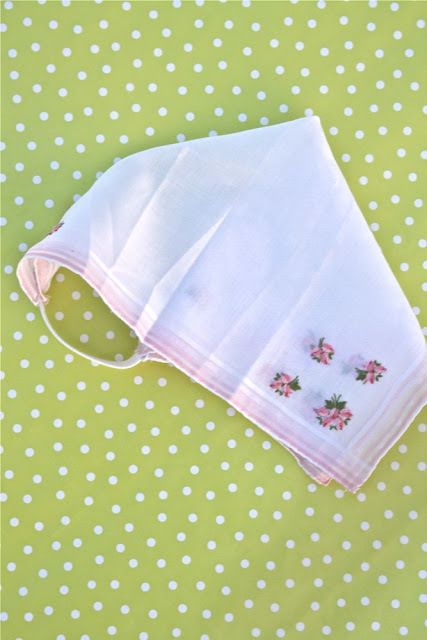 I love vintage handkerchiefs too! Yes, hook me up please! I need some of your talent in my life since my talent is on hold with a broken sewing machine. Besides, it's more fun to win things instead of making them!! 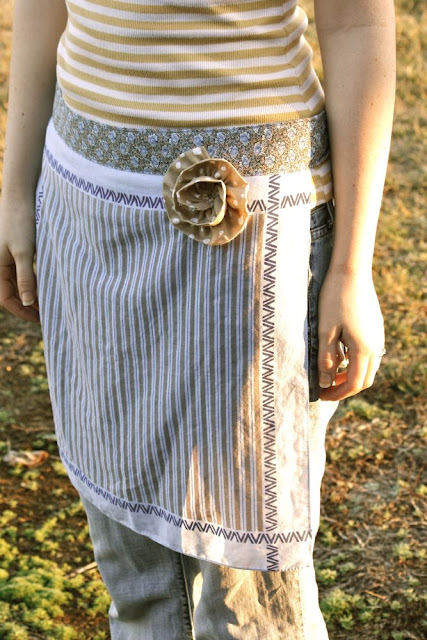 I have literally been searching Esty over for a new apron just this week! This one would make me a happy woman! Its so lovely! Where do you buy your handkerchiefs? SUPER cute! you are sooo talented! love it. I love the pinned flower hankies!! oh my goodness - super darling! I love the pin ones - looks like a perfect vintage flower - how smart! I have a bunch that I've tied to the top of my daughters curtains as a little fluff where that tabs/hooks connect - cottagey! these are my next year's christmas gifts! i never thought to use a hankie...i was using tea towels. I would love to win this - it's so beautiful! I always have to check your blog for updates before I can start my day! that is cute. my sister collects vintage linens too and has so many beautiful ones. Ok.. too sweet.. I'm am heading to the thrift shop now to look for hankies! That's it! I NEED to learn to sew. Please count me in! you are so talented! SUCH a cute idea! So adorable! I love this cute project! You are so talented! I just love your blog- from one pastor's wife to another, it's nice to be able to find ways to reuse things and make special projects for your kids from it. Thanks for sharing all your wonderful ideas! Wow! I had been given about half a dozen vintage hankies last summer--did not know what to do with them. They are currently in my scarf/belt drawer--just so I do not loose them. Now I know some things to try--Thanks! I think that apron is pretty sweet!! i am posting a link for this giveaway on my blog! super cute..i can always use a great looking apron! Ooh ohh me me!! I love it! It's so sweet. I would love to win! Love it, I want it, pretty please!!! How lovely, I love the vintage hankies that have silk screened "save the date" messages on them that have been popping up everwhere online :) Crossing my fingers for your giveaway, and working on my ruffle entry!!! The apron is just darling! Love it. I love vintage hankies too! Sooo precious!! I want one! that is just adorable. great ideas also! wow!! So super cute and vintagey, love it! Oh how precious... pick me (please!). That is so cute! Our thrift shops here must know the potential of cute vintage hankies, because they're so expensive here! i adore hankies! my daughter has the most precious hanky overalls! I love vintage hankies! Your apron is such a cute idea; I'm glad I subscribe to such a clever lady's blog. I have just been introduced to your amazing blog. I am still pouring over all the tutorials. I have been looking for simple ruffle instructions, THANK YOU! Thank you for the chance to win this lovely apron. I will be entering your children's clothing competition as well. What fun!